Ahhh, March is here! 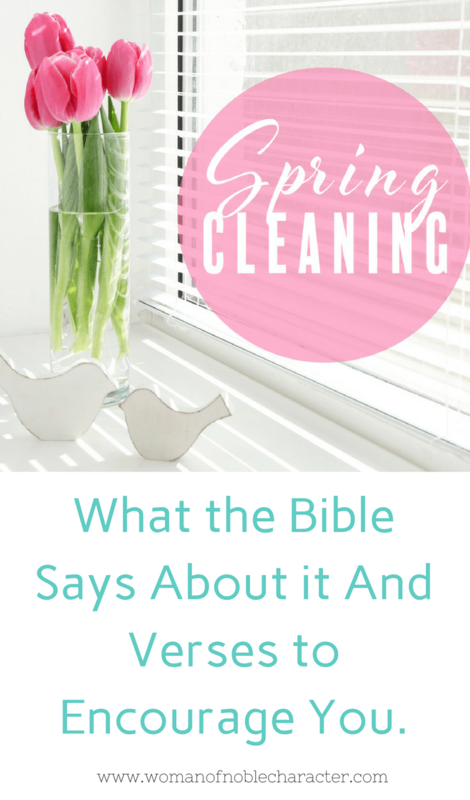 For many, it’s time to think about spring cleaning. As you know, spring cleaning is the practice of deep or thoroughly cleaning a house or other area. With spring comes newness and fresh air. Time to open the windows and let in spring breezes. 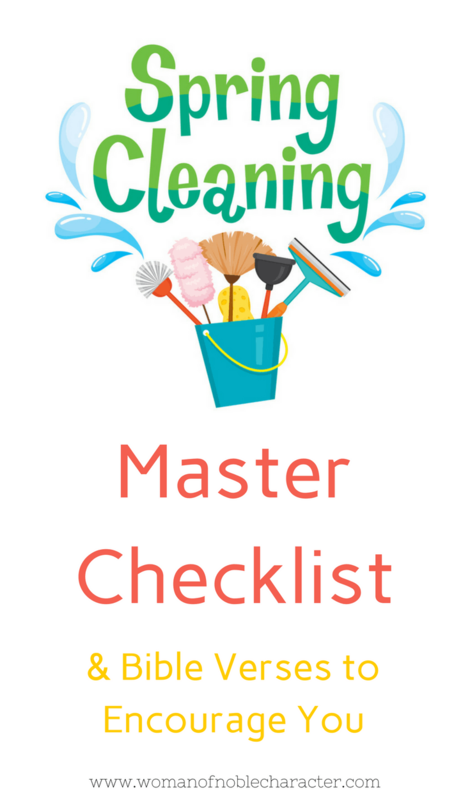 If you are a regular reader, you may have already downloaded the monthly cleaning checklist which should have given you a head start on spring cleaning. I use this in conjunction with the weekly cleaning checklist. 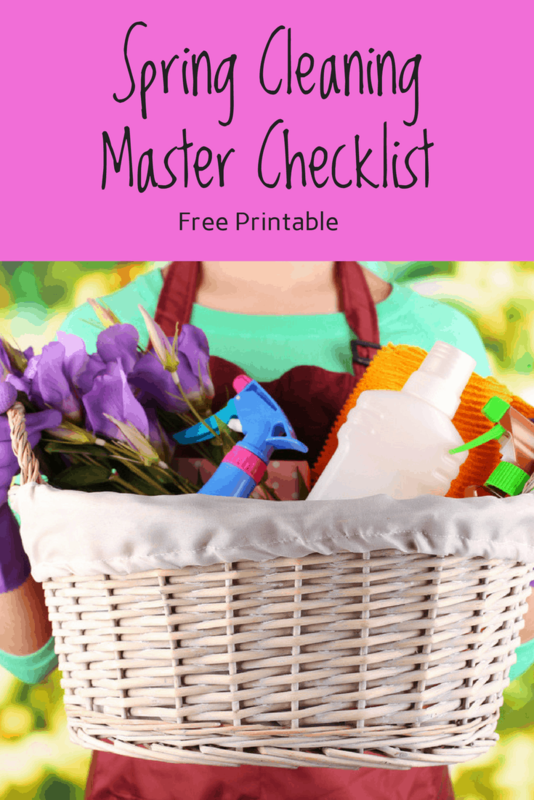 Below you will find the mega master spring cleaning list. Don’t try to get it all done in a day. Set aside time each week to tackle one room or area. 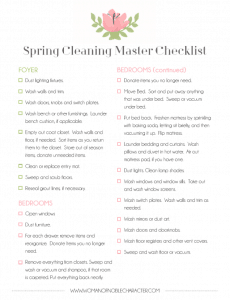 You can download and print the Master Spring Cleaning Schedule below. 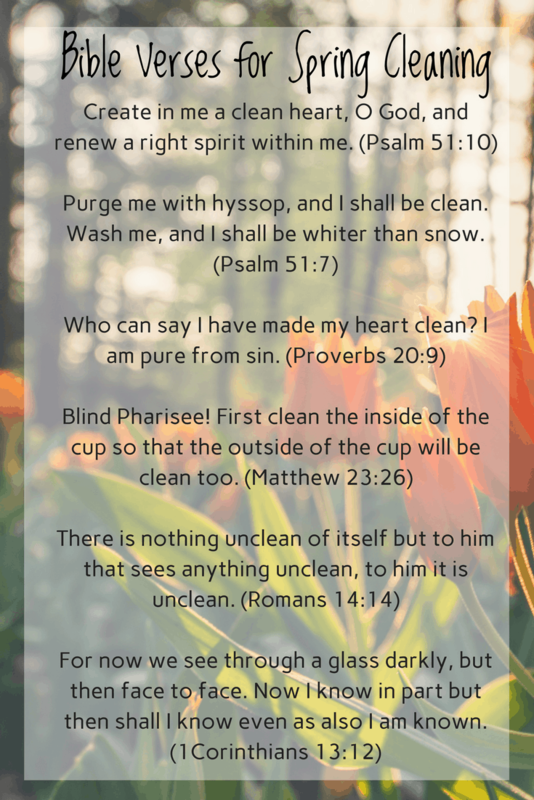 You’ll also find some encouraging Bible verses to help you tackle this years’ spring cleaning with your focus on God Almighty. Ready to Tackle Spring Cleaning? Don’t want to go down the list? Click on the image below for a pretty printable with all of the info! Wash doors, knobs and switch plates. Wash bench or other furnishings. Launder bench cushion, if applicable. Empty out coat closet. Wash walls and floor, if needed. Sort items as you return them to the closet. Store out of season items, donate unneeded items. Clean or replace entry mat. Reseal grout lines, if necessary. For each drawer: remove items and reorganize. Donate Items you no longer need. Remove everything from closets. Sweep and wash or vacuum and shampoo, if that room is carpeted. Put everything back neatly. Donate items you no longer need. Move Bed. Sort and put away anything that was under bed. Sweep or vacuum under bed. Put bed back. Freshen mattress by sprinkling with baking soda, letting sit briefly, and then vacuuming it up. Flip mattress. Launder bedding and curtains. Wash pillows and duvet in hot water. Air out mattress pad, if you have one. Dust lights. Clean lamp shades. Wash windows and window sills. Take out and wash window screens. Wash switch plates. Wash walls and trim as needed. Wash mirrors or dust art. Wash floor registers and other vent covers. Sweep and wash floor or vacuum. Empty all cabinets and vanity. Wash inside, replace items neatly. Discard expired medications and cosmetics. Clean toilet, inside and out. Remove seat and clean around seat bolts. Clean mirror and frame . Wash switch plates. wash walls and trim. Wash doors and door knobs. Reseal grout lines if necessary. Remove and clean window coverings. For each cabinet or drawer: Remove items, wipe out drawer, place items back neatly. Donate unneeded items. Clean and organize pantry. Check food expiry dates. Clean stove top. Remove elements and drip bowls, if applicable, wash and put back. Clean and organize fridge and freezer. Defrost freezer, if necessary. Check food expiry dates. Clean under fridge and stove. Clean crumbs out of toaster. wash counters and back splash. Wash and shine sink. Shine faucet. Clean drain. Wash windows and window sills. Remove window screens and wash.
Wash walls and trim as needed. Wash doors and door knobs. Wipe down table and chairs. Wipe down or dust other furnishing. Clean chair pads, if applicable. Create a pretty spring vignette on table! Dust any displayed china or serving dishes. Spot clean sofas, if applicable. Launder throw pillows and blankets. Dust shelves, furniture and decor. Wash windows and window sills. Take out and wash window screens. Tidy electronics wires. Tuck nicely out of sight. Label them, if practical. Sort through music and DVD collections. Purge things that no longer suit your families interests. Organize what is left in an attractive manner. Sort books and magazines. Donate or recycle ones that no longer suit your families interests. Wash hard plastic children’s toys with warm soapy water. Rinse and dry. Launder stuffed toys. Donate or store toys that your children have grown too old for. Don't Miss Out on Any Home Organization Posts & Tips! Wash laundry sink. Shine faucet. Clean drains. Wash outside of washer and dryer. Wash inside of washing machine. Wash lint trap with soap and water to remove filmy build-up from laundry soaps and dryer sheets. Let air dry thoroughly before putting back in place. Reseal grout lines, if applicable. Dust art and light fixtures. Wash exterior doors. Give front door a fresh coat of paint, if necessary. Clean or buy a new welcome mat. Power wash or wash siding. Power wash walkways, if possible. Clean blades of ceiling fans. Sort through and organize family photographs (digitally or into albums). Sort and clean any extra rooms or areas such as linen closets, utility closets and home offices. Change batteries in smoke detectors (this should be done twice a year), and make sure units are free of dust. Teach everyone in your household how to use a fire extinguisher, and review escape plans. Wash Window Screens: Using warm water and a mild dishwashing liquid, scrub each screen with a brush; rinse thoroughly. Wax Non-Wood Floors: Vinyl and linoleum floors that have lost their shine should be waxed with a polish designed for these surfaces. Most stone and tile floors can be treated with either a paste or a liquid wax designed for the material. You may want to laminate it and use a dry erase marker to mark off completed tasks. Subscribe to our newsletter and have them delivered right to your inbox! Alternatively, you can put it in your home binder to have easy access whenever you clean. I use mine in conjunction with the Daily Planner and To Do List and the Monthly Cleaning Checklist. Simply add a task or two on the days that I have a few extra minutes to tackle a small home project. By taking small, actionable steps each day, and using tools like the Monthly Home Cleaning Checklist, you’ll be able to get (and keep) your home in tip-top shape. You may also like this book on seasonal cleaning to help you throughout the year. What else do you include in your spring cleaning practice? Tell me in the comments below. Are you ready to live a Proverbs 31 Life and deepen your relationship with God, strengthen your marriage and better manage your home? Consider taking the Intro to Proverbs 31 Mini Course or joining the Faith Filled Home Monthly Membership program for Christian wives. Susan is a writer, speaker and the creator of Women of Noble Character ministries. She is passionate about helping Christian women live a Proverbs 31 life in today’s world. The Lord laid upon her heart to serve women to grow in Christ, improve their marriages and manage their homes stress-free. 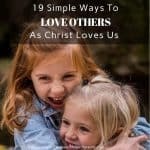 She provides tools and resources on her website for Christian women to grow in their faith, deepen their relationship with their husbands and manage their homes well. She lives in rural North Central Missouri with her handsome and hilarious husband and a myriad of dogs, cats and chickens. Susan runs on Jesus, coffee and not enough sleep. Thank you for signing up! Check your inbox for the printables. Neat way to mesh the two! Pinning! For some reason , my email address is not being accepted. SOAP Study Worksheet with Instructions PLUS in-depth Bible verse study sheet. Grab yours below. Yes! Please send me the Bible Study Worksheets.